Start from the "Belvédère" (1 km east of the Ramayettes gite). 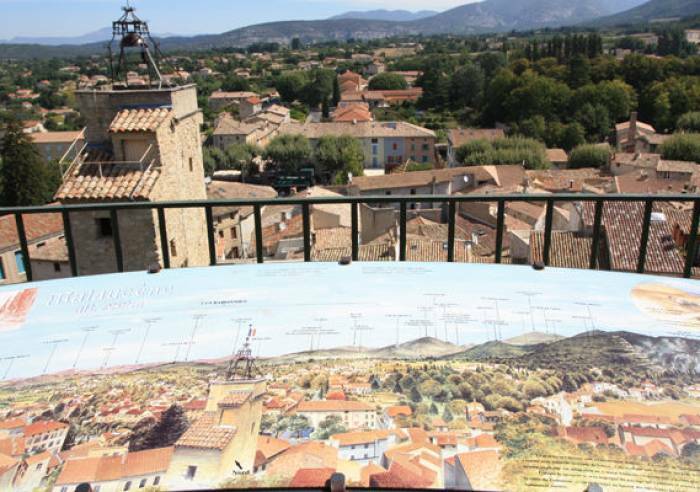 From the lookout point at 965 m you have great views of the Alazards valley, the Plate, Comte pass, the Ouvèze river valley and the Rhône valley, and the Dentelles de Montmirail. Go up 100 m along the side of the road, then take a trail on the left (if you look back, great view over the Comtat plains). This leads to the D974 at the Rams. Cross the road, take the path slightly below, then the trail to the left. It goes back up to the road. Follow it on the right for 300 m.
Just before the big parking lot at Prés-de-Michel (1,144 m), take the logging road on the right. At first it is horizontal, then it starts climbing. After 200 m, go up the steep part on the left. Go along the road on the right for 70 m, then go up on the right side path 150 m. Take the horizontal path on the right, continue on the path then again on a trail for 40 m. In the curve, go down on the path on the right, into dense undergrowth. As you come out, vast panorama over the Dentelles de Montmirail and the plain. Continue until you reach "collet Rouge" (1,045 m). Follow the path on the right which winds then dips on the right into the Malaval combe. When you reach the bottom of the combe continue down to the Rocher-du-Midi crossroads (771 m). Go up on the right on a stony path. At the top, near the "Tete des Mines", turn right and go up to the road, just before the Ramayettes forestry gite. Continue on the right for 300 m, til the Ramayettes curve. Take the trail to the left, which leads back to the lookout point.